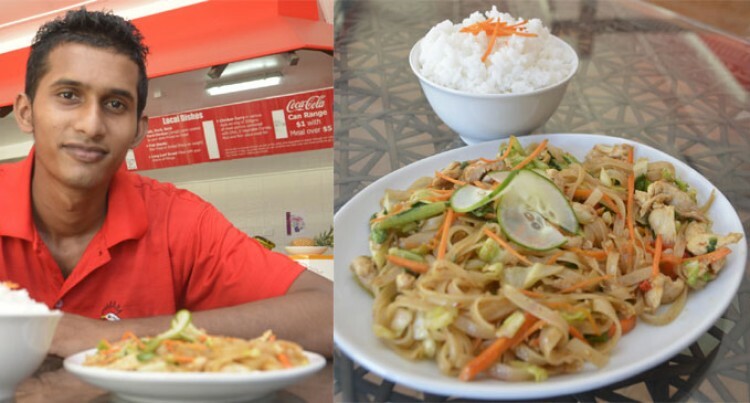 Chicken and More Limited, trading as the Food Hub, is the newest eatery based at Nadi Town. Food Hub is dubbed as the supermarket for meals. It is run by Friends of the Pacific, a New Zealand-based trust. The operation will considerably increase the variety in which chicken, ducks, lamb, goats, seafood, and vegetables are offered to members of the public, resorts and other retailers through its commercial butcher and kitchen. situated at Sagayam Road, Nadi. Babu Umlesh Junior, 23 years old. He joined Sitar in October 2010 before joining the Food Hub early last December. Born and bred in Votualevu, Nadi. He started his culinary skills training while at Votualevu Colle ge studying Food and Nutrition. He completed his eight months TAFE Commercial Cookery Certificate after secondary school education. – Add cabbage, vegetables, carrot, rice boodles, pepper, sugar, salt and sauté. – Add soy sauce, sweet chillie sauce, spring onion. – Depends on mild, medium or hot or add dry chillie to taste.